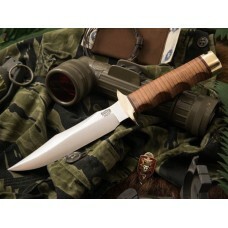 The New MACV-SOG from Bark River is Co-Branded with Vehement Knives. Matt Martin of Vehement and Mike Stewart Designed the MACV-SOG project together. 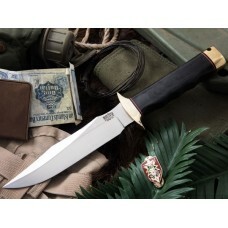 The knife has the Best Features of all three of the variations on the original MACV-SOG knives that were made for 5th Group of the U.S. Army Special Forces in the Vietnam era. Matt Designed the Slightly Longer variation Blade and Mike did the Handle and Pommel. The guard style that is being used is referred to as the "Fat Guard" variation from the first initial Run in the 1960s. This is actually the first time these knives have been made totally in the U.S.A. The originals in the 1960s were made in Japan and other copies have been made in Japan and in Taiwan. The Bark River MACV-SOG is 100% made in America. The black sheath has been designed by Jenna Martin of Vehement Knives. 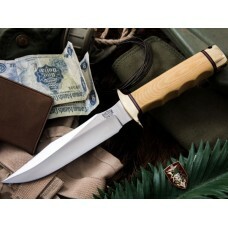 Bark River MACV-SOG Antique Ivory Micarta. 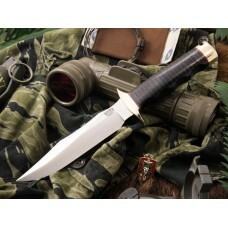 Bark River i samarbete med Vehement Knives resulterade i..
Bark River MACV-SOG Black Canvas. Bark River i samarbete med Vehement Knives resulterade in en myck..
Bark River MACV-SOG Black Stacked Leather. Bark River i samarbete med Vehement Knives resulterade i..
Bark River MACV-SOG Stacked Leather. Bark River i samarbete med Vehement Knives resulterade in en m..